Hi everyone! So today I'm going to be reviewing something a little different, but still something that I hope you will all find useful beauty wise. I won't be discussing any beauty products, but something important that we all need when applying them (and for checking out those fantastic results afterwards) - a mirror. 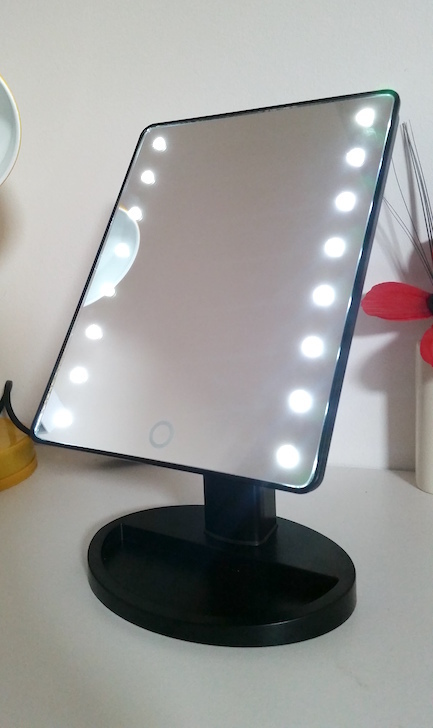 I was recently contacted by the lovely folks from TFCFL about trying out their LED Mirror, and coincidentally enough I was already considering purchasing one just like it. A sign? Perhaps. But I'm digressing. 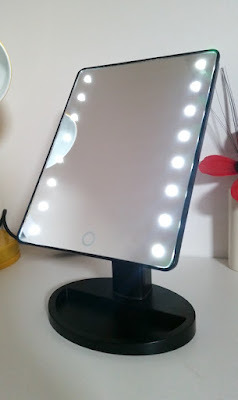 The Lighted Mirror is a rectangular, tiltable mirror that comes with 8 LED lights down both sides to provide the perfect lighting whilst applying makeup or for other beauty related business in which good lighting is needed (the man in your life could find it useful for shaving, for example). It also comes with a smaller 10x magnification mirror for getting an even closer view of certain areas when needed. The mirror dimensions are 10.5 inches by 6.7 inches, so it's perfect to fit on your vanity table or desk. It also comes with a small tray on the bottom for holding tools or products. 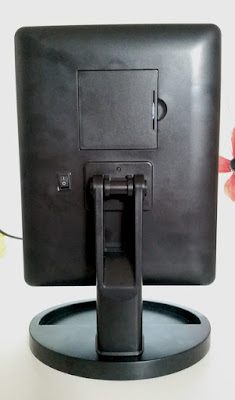 It requires 4 AA batteries (not supplied), so it is wire free and therefore easy to move around or fit into a space with no plug sockets (like the bathroom). It has an on off switch on the back, but in addition to the main switch it also has a touch button on the front that looks like an iPhone/iPad home button, but that works a bit like a touch lamp. Setting up the mirror is as simple as popping the batteries in. I did struggle a little to open the battery case, but it wasn't a big issue. The 10x magnification mirror is an optional addition that has little sucker pads on the back for you to stick it to the main mirror wherever you choose, if you want to use it. The tray at the bottom isn't one that can be used for holding your makeup collection. Think instead of smaller items, such as tweezers, or maybe hair clips. It may be handier to hold items that you're currently using - such as if you were using a blush that was small enough to fit - rather than holding them in your hand during use, but otherwise you probably won't be using it for your eyeshadow palettes. The LED lights are slightly blue white balance wise, so if you're going to be seen primarily under regular indoor lights, which are warmer, then you may want to double check your final look with the lights off at the end. The lights only have one brightness function and in some rooms with different levels of brightness this can be a bit dazzling. It would be nice to have different brightness options for different locations, but the level that it does have provides a great amount for spotting lots of details on your face. I personally love the brightness for when I am shaping my eyebrows as it allows you to see every single hair so that none are missed. My only real complaint with this mirror is the fact that when I move it to certain angles, it doesn't stay put. It will fall down and face the surface that it's on, I'm not sure if this is specific to this particular mirror or if it's a fault with the whole line. I also don't know if it is fixable by potentially tightening the screws, so that's something I'm going to be looking into. Overall though I think that this LED mirror is a great piece of kit. 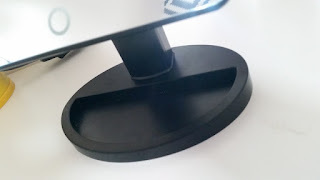 I think that the price is fair for what you get out of it it, and it's a really helpful item that saves a lot of time manoeuvring your mirror and yourself around to find the perfectly lit spot, giving you great lighting no matter what. I definitely recommend checking it out if you're shopping around for a new mirror. You can purchase the LED Lighted Mirror from Amazon. 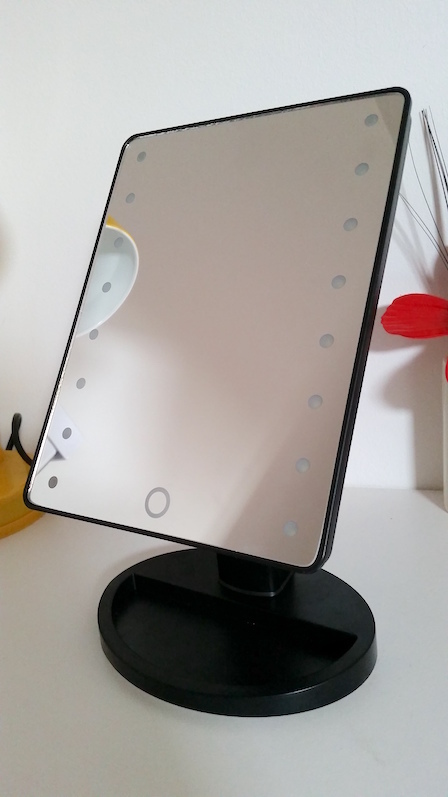 What are your thoughts on the LED Lighted Mirror? I have a totally different opinion of LED Mirrors. Mine has 20 lights and the lights have 3 settings low, med, and high. To me this mirror is just not functional when applying make-up. Even in the best lighting conditions and even with the lights on high it is just not bright enough. It looks very nice but to me it is just not useful. I'm so glad though that you enjoy it. As we all know everyone has different needs so I just thought I would let people know my experience.